A long, high speed bomb run across the desert started the 40 mile loop, which used many rocky washes and hillclimbs in addition to the high speed sections. Lagzdins’ Duncan Racing powered Honda TRX450R proved fast and reliable in the conditions, powering into the lead at the start and opening a 2 minute cushion by the finish. Yamaha mounted Chris Dobbins held second after the bomb run, but faded at the end with a flat front tire. Local Lucerne resident Johnny Moreno used his familiarity with the terrain to finish second. 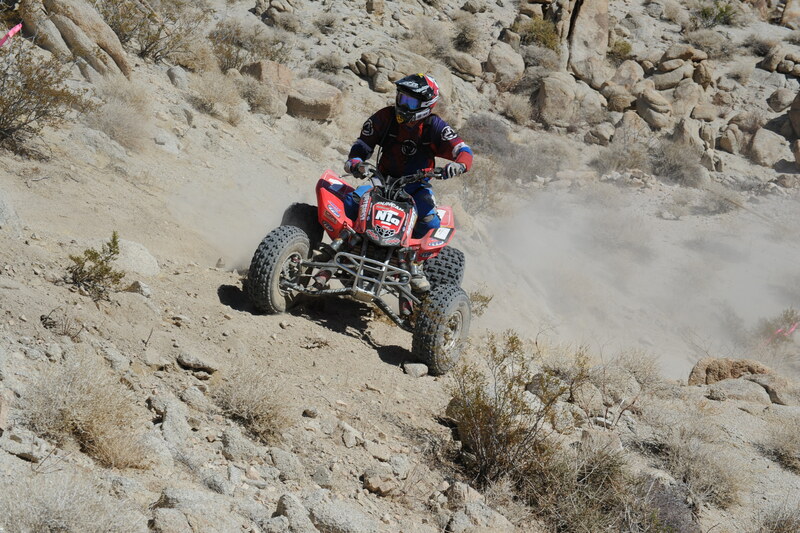 Honda rider Caleb Delgado rounded out the top 3 overall quads. Many riders suffered flats and punctures during the event, but Andy’s ITP Holeshot XCT tires equipped with Tireballs survived the brutally rocky sections of the course. “There were a few sections that made me feel like I was riding a Trials event on a quad! Popping over boulders and finding ways around dirt bikes that were stuck on the hillclimbs,” stated Lagzdins. Bill Markel, whose consistent finishes in the first two rounds had him second in series points, suffered a broken back in a crash during a race 5 weeks ago. Amazingly, Bill geared up and rode the race for points, finishing the event and vowing to be ready for the next round in Utah in two weeks. Lagzdins now holds a commanding lead in the series. The next race on the NHHA schedule takes place on May 5th in Jericho, Utah. Outstanding! Keep up the Great ridng! and be safe! !